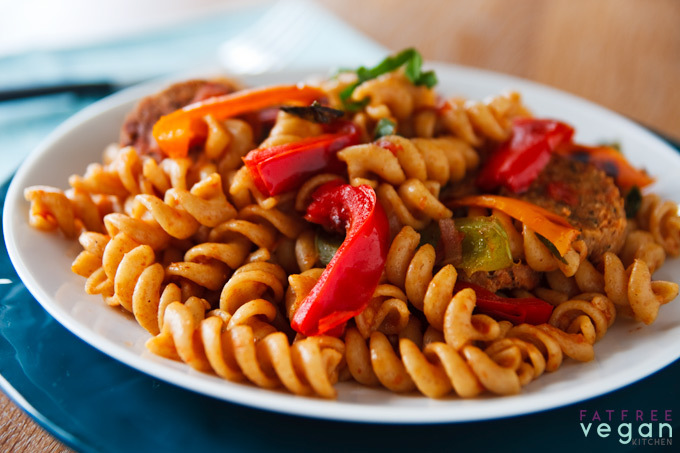 Italian seitan sausage flavored with fennel, sage, and basil make this vegan version of the classic Italian pasta with peppers absolutely delicious. I don’t know what happened to revolutionize the way whole wheat pasta is produced, but something must have. It’s evolved, in my opinion, from a heavy, grainy-tasting, fall-apart-if-you-slightly-overcook-it punishment for eating healthy into a delicious food that my whole family enjoys. I decided a few years ago that when it came to pasta, I’d stick with flavor over nutrition and use regular semolina or rice pasta for those rare times when I cook pasta. Then I started following Weight Watchers’ Core program, which allows limited amounts of whole wheat pasta, and I decided to give it one last try. To my surprise, the newer ww pastas are lighter and less starchy than the dark whole wheat pasta I used to buy from the bulk bin of the health food store, and instead of tasting chalky or grainy, they’re either pleasantly bland or slightly nutty (which actually works well with heartier sauces and seasonings). My daughter no longer complains when I use whole wheat pasta–in fact, she doesn’t seem to notice at all. I still consider pasta an occasional treat, but I no longer feel like I have to give it up completely–or suffer through arrabbiata that tastes like cardboard! 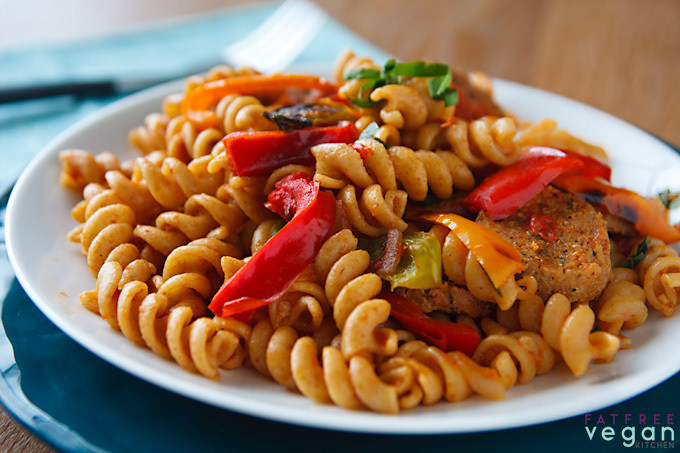 If you haven’t given whole wheat pasta a try recently, give it another chance. If you’re not sure which brand to buy, check out this taste test of 5 of the better whole wheat pastas. 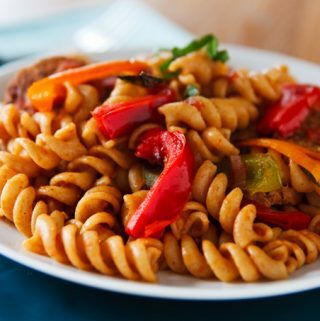 A nuttier-tasting whole wheat pasta will work well with this recipe, with its flavorful roasted peppers and highly-seasoned vegan sausage. I’ve been craving vegan sausage for a while, and I finally got around to making up an Italian version of the Irish sausages I made around St. Patrick’s Day. Both recipes were inspired by Julie Hasson, whose steaming method produces the most tender gluten sausages I’ve ever made. Of course, if you make this pasta with packaged sausage rather than homemade, you’ll be able to get this dish on the dinner table in under a half hour…but I think you’ll be missing out on some seriously good sausages! 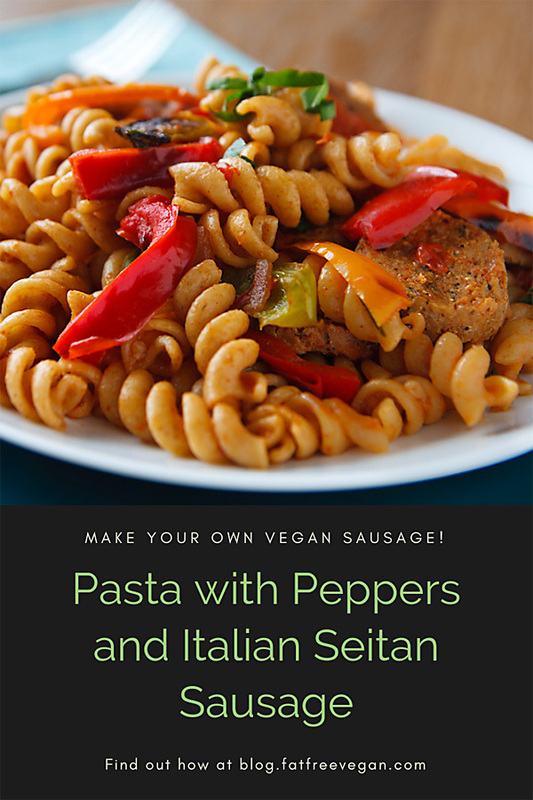 This vegan version of pasta with peppers and sausage has all the flavor of traditional recipes but none of the fat or animal products. Place a nonstick baking sheet into the oven and preheat to 425F. Once it’s heated, spread the peppers on one half of the sheet and the sausages on the other. Cook, stirring every few minutes, until the peppers just begin to get charred along the edges, about 10 minutes. Remove from oven and keep warm. While the peppers are cooking, cook the pasta according to package directions. Before draining, remove one cup of the cooking liquid and reserve it. Drain the pasta, toss it with the peppers and sausage, cover, and keep warm. Heat a non-stick saucepan on medium-high. Add the onions and cook, stirring, until they soften, about 4 minutes. Add the tomato paste and cook for another minute. Stir in the tomato, garlic, and red pepper and cook for another two minutes. Add 3/4 cup of the reserved pasta liquid and simmer for about 5 minutes. Stir in the minced fresh basil, and add salt and black pepper to taste. Toss with the pasta to coat lightly, adding additional pasta liquid to moisten, if necessary. Serve immediately. Don’t be afraid to make your own seitan sausage. The recipe below is practically fool-proof and is as easy as making a dough, wrapping it, and steaming it. If you want to avoid aluminum foil, use parchment paper, though I find lining the foil with parchment paper to be more effective. Sage, fennel, and basil make these vegan sausages so flavorful! Dissolve the bouillon cube in 2 tablespoons of boiling water and set aside to cool. Put the oatmeal into a blender and pulse to chop coarsely. Place the oatmeal into a large bowl and add the remaining dry ingredients, wheat gluten through flax seeds, stirring well to distribute the seasonings evenly. Mix the bouillon mixture with the cool water in a large measuring cup or bowl and add the garlic, tahini, and soy sauce. Whisk or blend with a hand blender until ingredients are well-distributed. Pour the wet ingredients into the dry, and stir to mix just until evenly moistened. Add a little more water if it seems too dry. 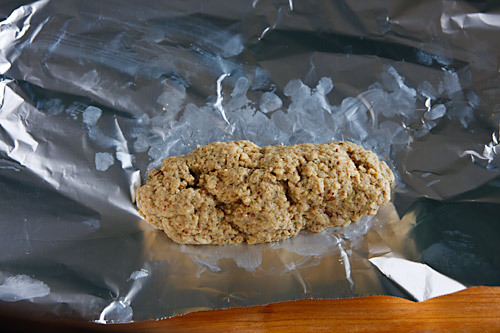 Place a piece of aluminum foil on the counter, and scoop 1/2 cup of gluten mixture onto it. 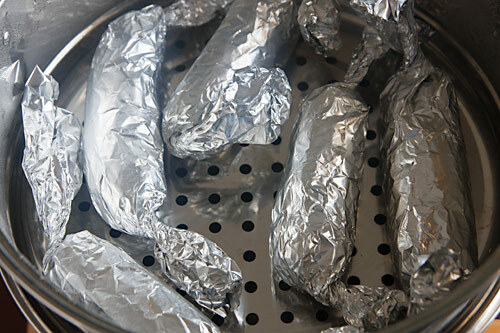 Shape into a rough tube, fold the bottom edge of the foil over the gluten, and roll up. Roll the tube back and forth, pressing lightly with your hands, to give it an even shape, and then twist the ends closed. Repeat with the remaining gluten to form 5 sausages. Place all the sausages in the top of a steamer, cover, and steam for 40 minutes. Remove them from the heat and let cool (refrigerating will make them firmer). Fauxsages can then be used in recipes as-is, but baking or pan-frying lightly will make them firmer and browner. This reminds me of a dish I used to eat as an omni. It sounds great, thanks Susan! Sounds wonderful. It is finally getting to be sausage weather here in the southwest and I am looking forward to making this particular sausage. Is the oatmeal in the sausage cooked or dry and do you use rolled or steel cut? Is it possible to make a gluten-free version of these sausages? Is there an ingredient standardly used as a replacement in recipes calling for gluten? I have not yet tried the ready made vegan sausages since i was never a sausage eater anyway.. but i like the fact that we will know what goes into it if its homemade..
is wheat gluten the same as seitan and is it tofu like, or are you using some kind of powder? where do we get that? 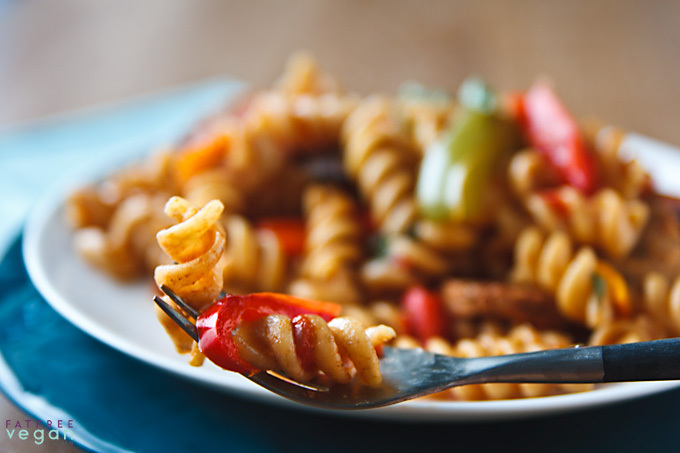 i don’t really mind whole wheat pasta, but my live-in boyfriend HATES it. it’s such a pain to try to eat healthy pasta with him, because all he does is complain about how gross it is. bummer. That looks divine! I’ve been searching for a vegetarian/vegan sausage recipe. Looks like I’ve found one. In the ingredient list there is no cashew butter, but it’s in the instructions. Is that missing or is that what should be the tahini/olive oil? Can you bake these? I don’t have a steamer right now or is there a way to get the same effect a different way? I’ve noticed that about Whole Wheat Pasta also. I don’t think my family even notices when I make it now. Hey Miss Susan! I thought of you and your blog today at Books-A-Million while I was looking through the Veggie cooking books. 🙂 We are going to Kroger tomorrow to pick up a few things and you’ve given me some terrific ideas. Wow.. I’m living in the Netherlands now and for my birthday my mom sent me a box full of food I really miss, including Zataran’s jambalaya rice mix, you know those “Just add the meat”. In America we always made it with Melissa’s Soyrizo (Soy Chorizo) but we were both extremely tempted to buy real Chorizo in a longing to recreate the past. Now I can just made this delicious sausage delicious! We have some habaneros sitting around so I think i’ll use one! This looks delicious! I think I am going to get over my fear of making vegan sausage and go for it! Jen, I wish I knew of a gluten-free way to make these sausages, but the gluten is what holds them together. I’ve made sausages from soy before–tofu and/or tempeh–but they don’t have the same texture. Still, some Italian-seasoned tempeh would make a good substitute for the sausage in this recipe. PB–The vital wheat gluten is a powder that you can buy in natural food stores. Seitan is a food made of gluten that has been simmered in broth. Sometimes people use the term seitan to mean any meat substitute made of gluten, and in that sense, these would be considered seitan sausages. Gymmie, thanks for the heads-up about the recipe. I forgot to change that part when adapting my Irish sausages recipe. It’s been fixed now. As for steaming, do you have a metal colander that you can set over a pan of boiling water? If so, you can put the sausages in it and put a cover over them. If not, you could bake them, but I’m not sure how much time you should give them; also, baking will make them tougher and drier. Rather than take the chance, I’d suggest making my Veggeroni, which is a baked sausage. I only eat whole wheat pasta, unless I’m eating out, and I have noticed a BIG change in the last couple years. My whole wheat pasta hating boyfriend can’t even tell the difference now! And I’m going to have to try those sausages. I love the Everyday Dish version, so these sound great! BTW, that last comment and this one are actually from Bianca of Vegan Crunk. I’m using the receptionist’s computer at work and she is Mean Mel. These sound soooo very good! I have got to try these this weekend. That pasta looks delicious. Do you follow the WW Core program? Your recipes always look so delicious, and you use a lot of nutritional yeast. I can’t seem to find any at whole foods, any suggestions? Thanks for the sausage recipe. I’m loving making my own. now that you mention it, I think there is a difference in ww pasta between now and a few years ago. I had some recently and wondered why I didn’ like it before. Thanks for this; I made the sausages this evening and they’re chilling in the fridge right now for use tomorrow. A preliminary taste test suggests they’re going to be pretty good! Also, just a note for anyone who might have been put off trying this by the lack of metric measurements: I used 40g of oatmeal, 150g of gluten powder, 225ml of water, and the rest of the ingredients as given. Do you think vital wheat flour can be replaced with a gluten free flour? I’m sorry, I Am Gluten Free. Gluten is an essential ingredient in these sausages. It provides the structure that keeps them from falling apart. Anything else would result in a rock-like, unleavened bread, I’m afraid. I’m not a complete convert to whole wheat pasta, but I do switch to it for hearty sauces like this one. Thanks for the taste test, and the amazing recipe! It’s good to know that I could still enjoy some of my favorites even going vegan. I would like to try this recipe this weekend, but like Colleen, I am unsure if I am to use cooked oatmeal or dry coarsely ground oats. Could you please clarify this for me? Sorry, Anon and Coleen, that I missed your question before. Use regular, uncooked oats (I used Quaker regular(rolled) oats, but quick oats will also work). Wow, these sausages were amazing! They were even better than the ones you buy pre-made at the store, I know what it is in them, and they are much less expensive, too! I could do without fausages, but my hubby loves them, so I do buy them occasionally, grumbling at the $1/ea. price tag. No more! They’re really easy to make, too! these look so good! however, i don’t have a steamer! is there an alternate way to cook/set them? am i missing something? Seitan and this AMAZING recipe. Thank you SOOOO much! these look so good! however, i don't have a steamer! is there an alternate way to cook/set them? am i missing something? I have been looking at your website and recipes and am going to try some of them. I have printed off a couple to make tonight. I am sure I will enjoy. Looking forward to more recipes. This looks delicious. The Tofurky sausages would be good in this, but they are far from low fat. I’m still not a huge fan of whole wheat pasta, but I do love spelt pasta (which, being a whole grain means that I can still get my healthy pasta fix)! I wish I liked vegan sausage. I think it tastes like ground cardboard with spices. Does anyone have a favorite that I could try? My goodness! I made the sausage portion of this recipe and served it with your Macaroni and Cheeze recipe. So easy and everyone enjoyed it. I’ll definitely make this again 🙂 Thanks! 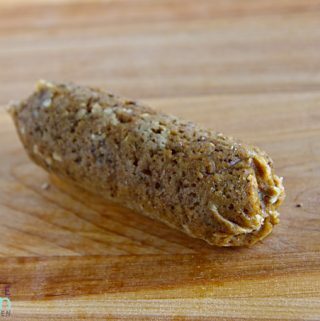 Do seitan sausages freeze well If so, does cooking time/method change once defrosted? I think that once they’re cooked, you can freeze them. Then all you have to do it defrost and heat them to make them ready to eat. I do not have a steamer, what else can you use to cook these? Is it possible to make your own “steamer”? You should try spelt pasta if you can get it where you live. It is pricey, but as an occasional treat, it’s worth the money. Also, I don’t think Spelt has gluten if that is a concern for you. These seitan sausages are delicious – perfect texture.Versatile, too: used the basic recipe for a Mexican flavored sausage, swapping basil, sage, fennel for ancho chile powder, chipotle, cumin, Mexican oregano and, of course, lots of garlic! Absolutely fantastic with black beans, etc. They’re so easy to make and keep/freeze well. Not a day goes by that my kitchen isn’t touched by something you have created or taught me. Thank you, Susan! Hi….is it possible to make these in a pressure cooker. I have an iPot and love it. I have the same question!?! Has anyone tried this? You can definitely use the IP steam function to make the sausages. I haven’t tried it, but other people have told me they made them using the pressure setting, but I’m not sure of the timing–maybe 25 minutes on high and then natural release? Thanks, Susan. I did 20 min on manual setting with natural release, laid 4 sausages on steamer insert w/ 3/4 c. water in the pot. Came out perfectly! I scrolled through all of the comments hoping someone had asked this. I haven’t had a working stove for a while now (the reason I finally gave in and bought my Instant Pot), but I have been craving Susan’s seitan ribz, and my usual seitan Italian sausages. I saw this recipe mentioned elsewhere and decided I need to try it now. I’m glad you answered the IP question, Werner.